I’m not sick, I’m not dying, and I’m not counting down my last days, but some day I will be. One day I’ll say goodbye to this world as I step into the arms of my Savior. The question is, how will I be remembered? Or better yet, how will my God be remembered? Last summer a friend of mine received a special gift on her birthday. A card, from her mother who passed on months before. She had the forethought to write each child a card before she was gone. Something to remember her by. Something to brighten their day in her absence. Breathtakingly beautiful, if you ask me. My story is different. 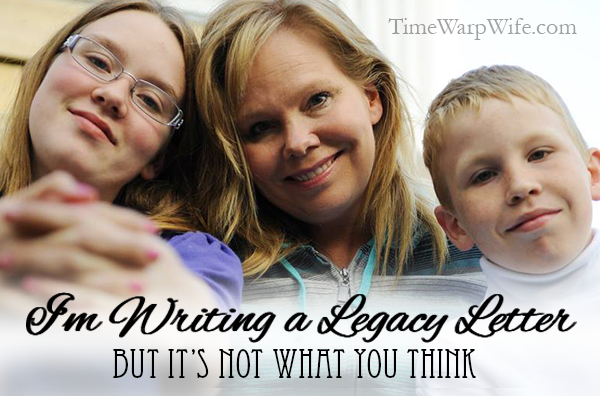 I’m writing a legacy letter, but it’s not what you think. I’m journaling through the Bible. Highlighting the parts that stand out to me, and writing notes for generations to come. My hope is that my children, my grandchildren, and my great-grandchildren will have a keen interest in reading those thoughts that I leave behind. I want my children and their children to pick up the Bible and to find encouragement there. I want them to stop and let scripture sink in. There’s an extra blessing in this, because I find it relaxing. I love doodling on the pages while I meditate on the words. It’s keeping me away from computer, which is kind of nice after all of these years. I’m spending time at the kitchen table, drawing, and coloring, and highlighting some words. Want a sneak peek? I’ve posted some of the pages below (scroll down). I hope you enjoy them! ACCU-Gel Highlighters Study Kit* – The six colors are so pretty! ZIG Writer Dual Point Marker: Black* – This pen dries fast and goes on easier than a regular black pen. It’s great for lettering. ** Edit: I mentioned using a Sharpie in the first draft of this post. But tonight, I learned by trial and error – it wasn’t good. The Sharpie bled through the page. The Zig Writer doesn’t. I got the Zig Writer at Michael’s craft store in the scrapbooking department. You could ask a worker if you’re not sure. Pencil crayons. Try to get at least 24 colors. I might move on to watercolors one day, but I’m still a baby stepper right now! *Update: I just started using watercolor pencils. Wow! I love them.They blend so much better than pencil crayons do. They actually don’t bleed through the page like I thought they would. I can see them a bit on the other side, but it’s not bad. Rubber stamps. I picked up a couple at the craft store, but they are expensive, and can add up fast. I’d suggest checking out the “Easy Accents” video below before you buy any stamps. You’ll see that there’s a lot you can do yourself with a black pen–even if you’re not great artist. I’ve recently moved away from the rubber stamps because, I find that drawing my own gives me more variety and it’s cheaper. Inspiration. 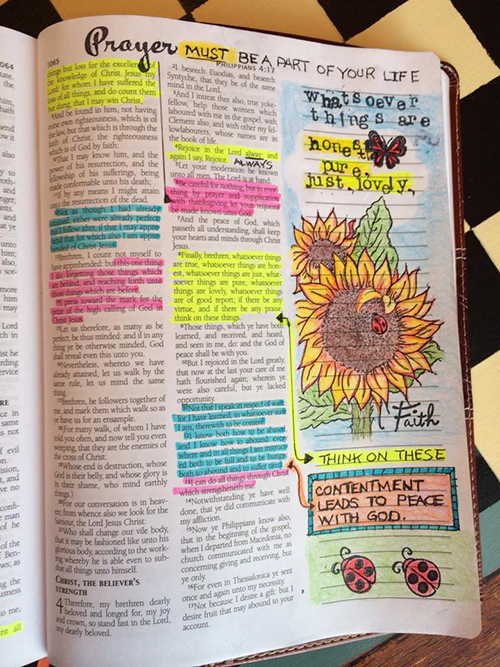 Follow my “Bible Journaling” board on Pinterest where I pin lots of inspiration. It might give you a few ideas! The first three are the most recent. They were done with watercolor pencils and a .01 Micon pen. What an amazing idea! My husband died very unexpectedly 3 years ago. He had had many Bibles that he used and wrote in over the years, enough that each of my kids will get one of their dad’s Bibles. I can tell you it’s a treasure to hold their dad’s Bible and see his handwriting on scriptures. ::tears:: You are doing a wonderful thing to think ahead! Blessings. What a beautiful post! Yes, only what we do for the Lord will last. Thank you for telling us about the KJV Journaling Bible! 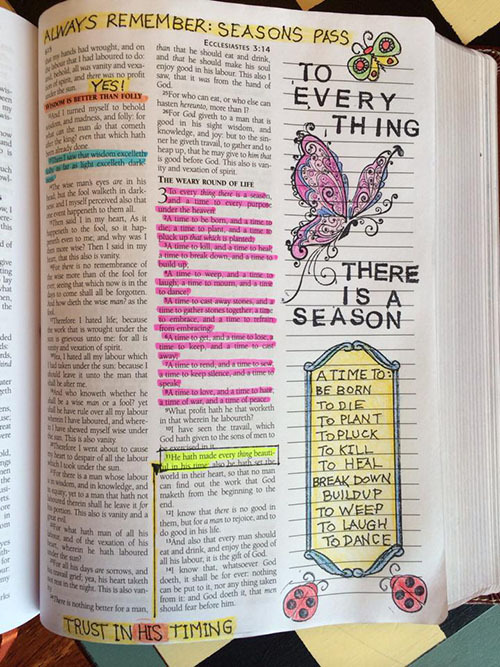 It is my favorite version and I love to highlight and mark up a Bible before buying a new one I can mark all over! I went back and really looked at the pictures in your Bible and your doodling. Did you draw them? They are beautiful! They are rubber stamps that I colored in. But I want to start doodling my own. What a beautiful idea. What a blessing for a grandchild to receive. Good thought! I’m glad you confirmed it. I added a date to one. I’m going to go in and date the others too. I write notes, highlight, and write definitions, the original languages,etc., but this is so inviting to read. I could see me doing this. This reminds me a little of Kay Arthur’s Inductive bible studies, except much more personal. This is truly a treasure you are leaving your kids. Even though you you say you have not colored for quite a while, these are beautiful and very creative. Thank you for directing us to the tools you are using to create this legacy for your kids, I would have had no idea where to look or what to buy to get started. Thanks so much @Joanne. I’ve never seen Kay’s studies, but hear a lot about them. I got to sit beside Kay at breakfast last summer. That was pretty cool. She’s so sweet. Darlene, what a fabulous idea!! I have been wanting to bible journal and didn’t know where to start. I love what you have done and this inspires me to begin this for each of my children. I also love the idea of the letter writing. Thank you for your wonderful blog!! My husband and I are really enjoying the marriage prayers. How exciting. I have to warn you… it’s too much fun! I have literally started doing this myself in the past month! I too would love to think that my bible is passed on to my children and they can feel the connection and know that the words come alive ! I’ve been using a date stamp too ! Loving it ! Now my mum has joined in. I can see it’s going to be a massive thing I’m so hooked and falling more in love with the Word as a result ! Highly recommended ! I’m pulling out my date stamp tonight! I need to use it more often. What a beautiful, precious legacy! I love this! What do you use for pens and highlighters?? Jessy, I posted a little list just above the images. I hope that helps. I have my grandma’s bible – it is a treasure to see her notes. I would love to have one of my mom’s bibles – I need to remember to ask my dad for one. I love to date and name when someone spoke on a specific passage and then make notes on what God spoke to me about on this passage. The last two weeks at bible study we have spoken about legacies and how important they are. That a lot of times it is the little things that make up our legacy. When I think about the important people in my life that have already passed and their legacies they are all centered around their relationship with our Lord. 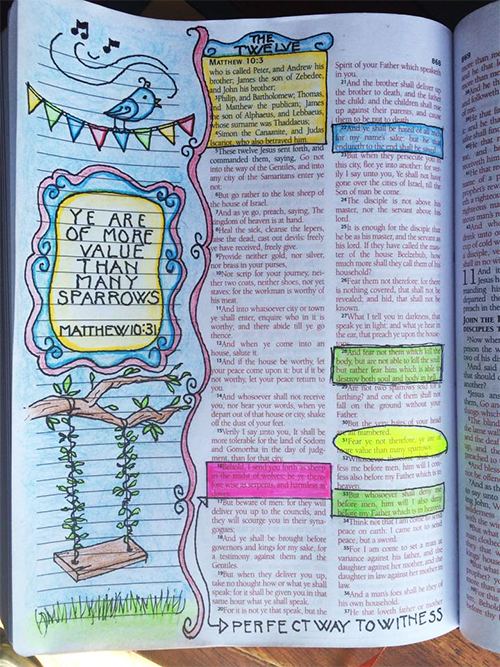 Darlene, I was so inspired by by your Bible Journaling, I purchased the KJV Journal Bible you recommended, along with the supplies that you use. I had , in my younger days. Been a doodler, always drawing on anything I could get !y hands on. But over the stress and hardships of life , had buried that creativity in me. I feel it was God Directed through you to inspire me to uncover that gift that has lain dormant. How awesome to think that !y children, grandchildren,etc will be connected in such a way to His Word, through a Blessing handed down to them. I am anxious to begin, I love His Word and I am grateful for those like you, who serve to inspire . In His Name! We lost my grandmother almost two years ago…and the most talked-about item she left behind was her Bible. It was literally falling apart, almost every word was highlighted, and her handwriting took up every spare inch of blank space. It wasn’t fancy…but it didn’t have to be. It is an absolute family treasure. Wow. I would LOVE to receive a family heirloom like that. A friend of mine is currently going through Spergeon’s Bible and transcribing his notes. It’s so cool! I will join you in this. Pinning now! That’s awesome Anne, I’ll check out the link. I left a note on your fb page. I was the one who gave you links to spotify. I am listening to you speak. I have had so many times I would have gladly stepped up. I would love the opportunity to share some of the things i have done. I hope that you will accept my friend. I would love to be a part of something similar, however, there are small things I do. Yes, we do compare ourselves with others. I have spent my life trying to help others. Perhaps we will speak via fb. Thanks for your words. Melde, thanks so much for your comment. I try to keep my Facebook page small so I have my kids and family on there and a few friends, but not many. I find it takes up so much time, so I prefer to be on my TWW page mostly. Wow your work is Awesome. Hope you share many more of your work. Eveline, that’s sweet of you to say. Thank you! Darlene, I just love this idea! I can’t wait to start but I am having a hard time finding the right bible for me. Do you or anyone else have suggestions? I would rather use an NIV or ESV instead of a KJV. I also would like something about 9″. Your bible looks just right but has anyone seen it in a different version? You are so creative and full of inspiration! Thank you for your posts. I know that Courtney from Women Living Well recommends this one. It’s an ESV with wide margins. I love this idea and am going to start doing it for my grandchildren. I am an avid scrapbooker so I have many of the supplies already. I was wondering what ink you use with the rubber stamps that doesn’t bleed through the pages. Thanks! I used the one in the scrapbooking department. I was surprised at how little it showed through. But I might not be as picky as the next person. Thanks so much for this inspiration. My husband and I are in the adoption process and this is exactly what I needed for the time we are waiting. Hi Darlene, I’ve been wanting to start prayer/bible journal, and don’t remember how I stumbled over to your website. Wow! 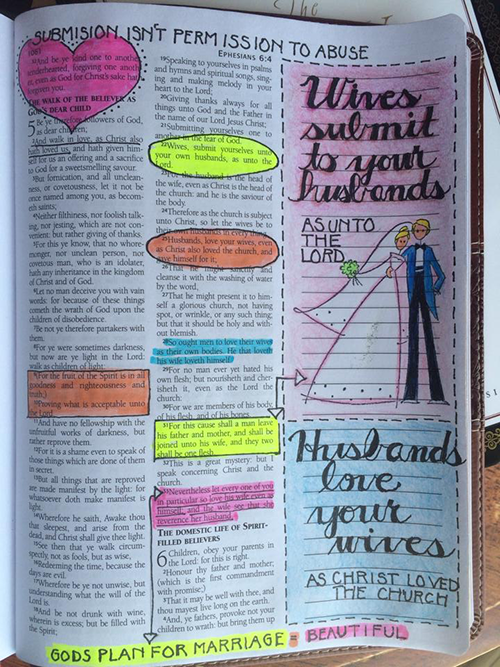 What a very creative way to add doodle around the scriptures in the bible! I wanted to ask you what do the colors represent when you highlight over them. I couldn’t find any information about that. I know it must mean something and before I start highlighting the verses in my bible, I just wanted to be sure they are in the right color! Thank you for sharing your God-given gift with us! Ok, I’m sold on this idea! Thanks so much for posting and sharing!! What kind of ink do you use for your stamps? The girl at Michael’s recommended Sazon for me. Pigment inks such as Colorbox, Versamagic and Versacolor would be best. Not dye inks –they bleed. What a BEAUTIFUL gift for your family. I like this idea – I have cones something similar to a recipe/canning book. I want to start in my Bible – its better than my leaving notes in my prayer journals. My question to you is: What type of Bible pages do you have? Both the bibles I have, the paper is so thin and if I use anything other than Bible highlighters – it goes straight thru to the other side. I’m using a KJV journaling Bible. I’ll post a tutorial tomorrow, and you’ll see how well the pages take paint. Maybe you haven’t tried paint? My pages are very thin like most Bibles. GREAT idea! However, i don’t care for the KJV….is there an NIV version available? I’m not familiar with the NIV version. If you pop into our Facebook group, you can ask the others. Or you might be able to look it up on Amazon? Great article. 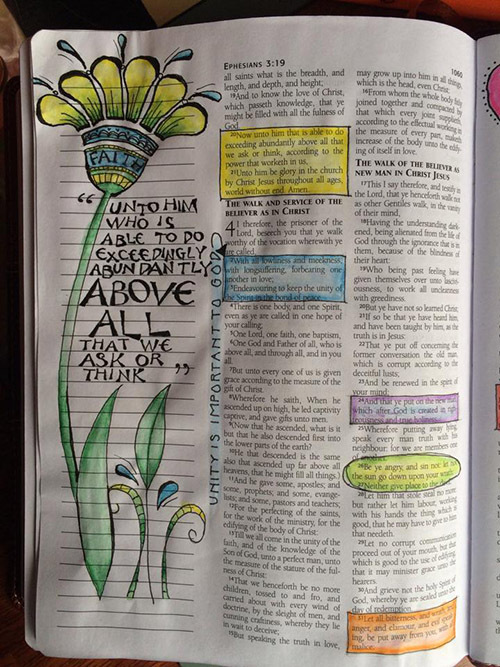 I have always made notes and highlighted things in my Bible. I have often thought that perhaps someday my children may take an interest in what I have studied throughout my Christian journey. Mine are not as artistic as yours though, how fantastic and inspiring yours are to see! My own mother was what I called a “kind of” Christian, my sister and I often prayed for her true salvation. I had even given her a Bible and highlighted specific verses for her. My mom just passed away last December 2015 and I was obsessed with finding her Bible. It was confirmed that she had been going to church and her friend had seen her with it just 2 days before she died. My dad and my sister found it and called me. My sister flipped the Bible open and it fell open to verses that my mom had highlighted herself! That felt like a message from the Lord, that she was with Him! 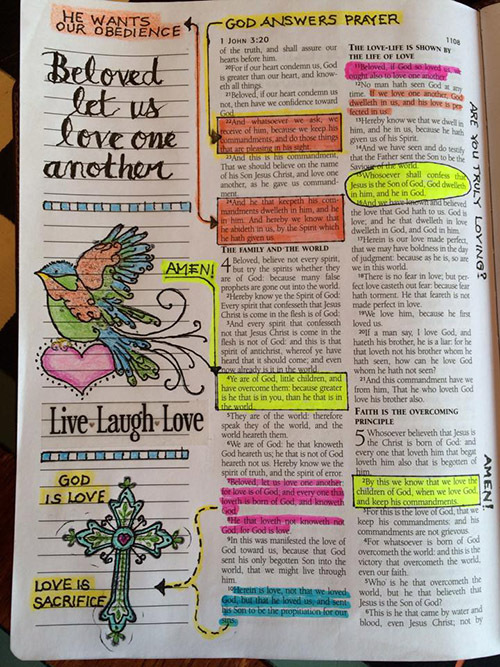 Her highlighted verses were, 2 Tim 4:6-7! So you see, it really is a true legacy and a gift for your children. Wow!! That’s amazing. Love this. I have been receiving emails from you for quite sometime because I found you on FB. I enjoy reading your articles and they are a great help. I think it is wonderful to leave a legacy like this. I started blogging recently because for quite sometime the Lord had impressed upon me the need to teach a younger generation of young women some simple, needful things. Things like cooking, herbal remedies, crafting, sewing/quilting, being thrifty, and above all, being a good Christian wife. Just wanted to let you know you are a blessing. Darlene, I love your journaling. I’ve also just started this, in the very same Bible you use! Could I just ask you two things? Do you use water with your watercolours? Do you prep your page with anything before stamping or writing? Karen, I don’t prep my page at all. I use water after I color with the watercolor pencils. It never shows through. Black ink is a different story. It will sometimes bleed through. But Micron pens seem to the the best. I want to start in January. I just want to know do you or people do a art Journal page every day. This seems like a lot, because it must take some time to study the scripture you have picked and do the art work. Do you pick a special day of the week to do this or what. Also do you just read the bible each day as I do and then pick a verse from that reading. or do you read a devotion to do either each day or once a week. I do not want to start and find it to hard to keep up each day. I was thinking of aside a study or devotion or perhaps one of the challenges on a special day to devote to this.. Can you and other share with me how they do this. I haven’t even started and I seem overwhelmed as to what to do, and how to get started. Thank you and God Bless you for your wonderful work and sharing what you are doing. 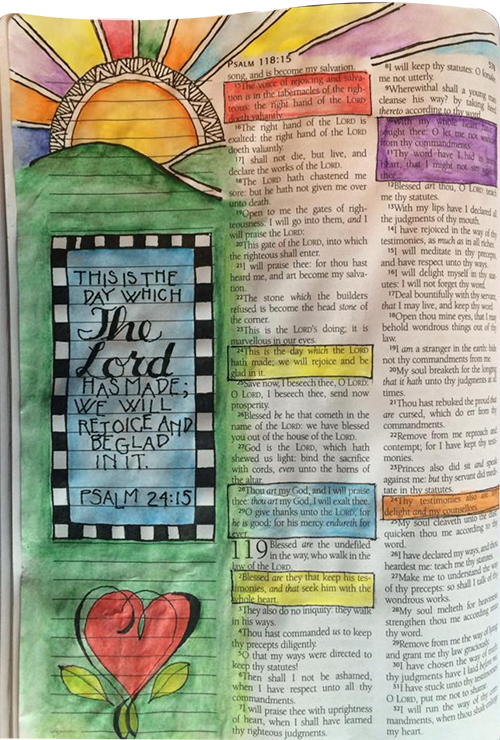 When I do my Bible journaling, it usually takes me about two days to draw and paint and image. I usually pick my favourite verses to journal, or ones I’ve been thinking about through the day. I also have a separate time for Bible study, which is a bit faster pace. So I like to do both. Every one is different, right? Thank you for your reply, I can’t wait to get started. I just know I am going to love it. I want to be able to read it Thanks again. Found you on PINTEREST by accident and immediately fell in love with your fantastic idea. I had the idea of writing little notes to my granddaughter since she was born. I have done quite a few letters through the years, but when I saw your work – It was like an explosion because all the while I was writing her letters about what is in the bible, but her you do one better – you USE the bible!!!!!!! I find it beyond amazing as the last few years I have not been the best child of God by not going to church or really spending much time in God’s word as I was very hurt by a pastor and a few people at our church, so I turned away from the church and as usual – started spending less time in God’s presence and word. With what you are doing, it gives me a chance to get closer to God again as well as I can create a stunning gift for my granddaughter to give to her when she is older. I must tell you – I used to have a wonderful imagination, but due to depression that pulled me waaaaayyyyyyyy down the last 10 years, I struggle to get my “mojo” back. May I use your ideas in my project? Are you going to add on so one can get more (at a lack of a better word) education? I feel it gives me a start from scratch rather than just to jump in. Thank you so very much for sharing your work. It is awesome and so inspiring. Elmarie, you’re creating such a gift for her! Everyone should have a Grandma like you. Did you know I have a facebook group for this? You’d really enjoy it there, and you’ll receive a lot of awesome tips. Your pages are stunning. 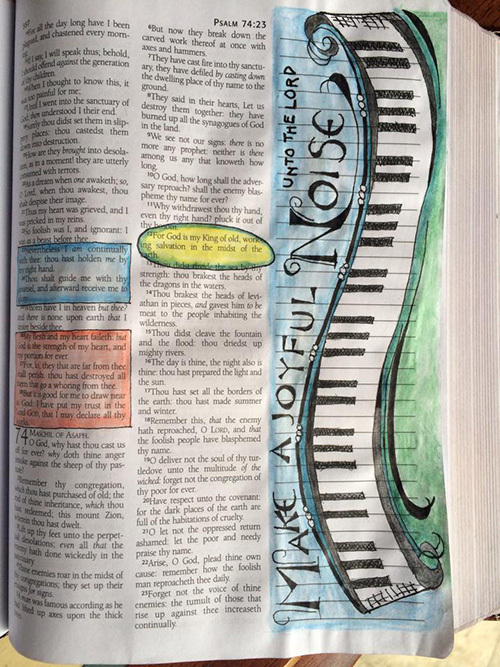 I love how yours is more about notes through the bible with art. It’s like we can see what you were seeing when you were reading. Just amazing. Thanks for sharing. Found you through Pinterest and am just blown away. Thank you so much for taking the time to share how you got started and why–as well as to reply to all of the comments and questions. 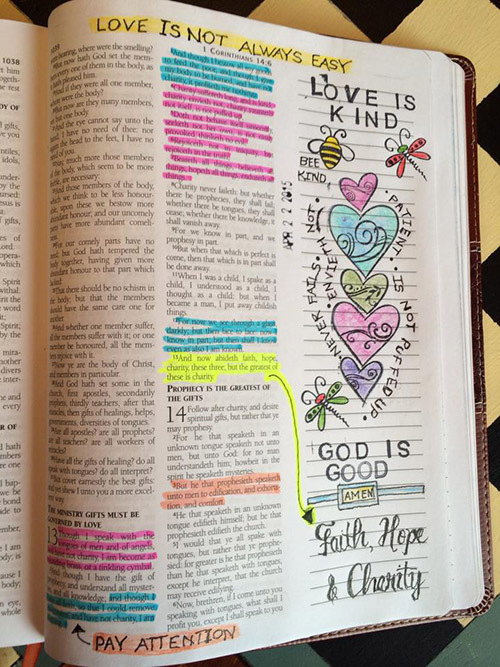 (LOVE the idea of leaving my children a legacy through Bible journaling) I received a journal Bible for Christmas and can’t wait to get started…and your post has totally empowered me to take off. Awesome Angela! I’m glad you found me! Woohoo!! I have my paternal grandmother’s Bible. She was a great Bible scholar and prayer warrior. She wrote something on nearly every page and notes about the Word, our family and even the weather and interests of the day. It is one of my most prized possessions and truly a legacy of love and faith! Thanks for the tip. I found that my inks were smeary when I prepped my pages. Maybe I need to wait for them to dry longer when the page is prepped? I’m not sure, but I had trouble with it. Amazing talent and so inspiring!! Darlene, thank you for sharing!! I am so excited to get started…a very late bloomer, I know being over 50 but better late than never!! And besides, autumn flowers and colors are beautiful 🙂 Blessings to You! Thank you for sharing such inspiring and wonderful article! That’s really amazing, i hope that you will continue to sharing this type of information. I have no words. Are you professional writer? If yes, I’d like to say that we are colleagues. Mello’s is a mix of fuctionality and design that lie at basis of the realization of a range of products that become an allyable to be an integral part for the realization of their adventures. We select and combine materials capable of responding of the needs of those who,driven by their instinct,want with curiosity and ruthlessness to discover what the explosive fantasy of nature can offer. Such a great article, that’s really amazing. I’d love the way you’re doing great work. Thanks for this knowledge-rich article. If you are looking to buy land, plot, flat or bungalow in Ranchi, contact RS Construction. You can visit our website http://www.rsconstruction.in/ for more info. Great article, thanks for sharing. Medixo is your one-time solution for all your medical drug needs. Visit https://www.medixo.in/ to know more. Thanks for compiling all the info. to articulate this blog post. Appreciate your dedication and efforts. If you are looking for Best Ayurvedic Panchakarma Treatment in Dhanbad you can seek the following services here in http://www.keralaayurvedacenter.com. Skin Care Clinics, Ayurvedic Doctors, Ayurvedic Hospitals, Hair Treatment Clinics, Ayurvedic Clinics, Ayurvedic Treatment Center For Panchakarma, Hair Loss Doctors, Ayurvedic Treatment Center. If you are looking for Best Ayurvedic Panchakarma Treatment in Dhanbad. you can seek the following services. Skin Care Clinics, Ayurvedic Doctors, Ayurvedic Hospitals, Hair Treatment Clinics, Ayurvedic Clinics, Ayurvedic Treatment Center For Panchakarma, Hair Loss Doctors, Ayurvedic Treatment Center. Thank you for sharing the post with us. It was very entertaining. keep sharing your beautiful ideas with us. So, we can enjoy reading the post. Thank you very much, dear. Though Mcafee removal tool is one all told the leading antivirus code it always faces technical difficulties which might embody the dearth of installation or un-installation of the computer code. tho’ installation of Norton Antivirus isn’t a troublesome task and it merely is sometimes placed in by downloading or from the CD, however, if you’re facing issues incorrect installations then you may be able to reach bent our Mcafee Antivirus support for facilitating with none hesitations. to remain your devices safe from the attack of virus, malware, spyware, worm, and plenty of uninvited threats it’s a necessity to possess Mcafee virus protection inside the system. And if you would like to facilitate in any operation then you will choose Mcafee client Support. Your article is rich with information. Harsh Packers & Movers Ranchi provide quality packing and moving services across India at affordable prices. We are Best Packers and Movers in Ranchi. Search http://harshpackersmovers.com/ for their services. Pollution and malware have wound up being a standout amongst the most genuine dangers for PC clients. Each time you surf on the web or you relate any outside plate drives to your PC, it has a danger of getting debased by dangerous endeavors. To shield your structure from defilements you require an OK antivirus which can ruin the hazard of illness and malware in your framework. Mcafee Customer Support Toll-Free +1-888-441-1595. Call our cultivated customer advantage to assemble for Mcafee Support on the going with number all day every day. Rajasthan is arranged in the north-western bit of India, suggested as the Desert Jewel of India. A vivacious, exceptional state where custom and grandiose think about gathering in a swarm of tones against the huge scene of sand and desert. The intrigue of Rajasthan is unequaled on the planet for its inheritance, culture, safaris, sand grades and rich green timberlands with its standard life. Rajasthan has an unpredictable tolerable accumulation in its entire structures – people, conventions, culture, outfits, music, affinities, vernaculars, cooking, and geography. The Kailash Mansarovar Yatra is one of the holiest undertakings for the Hindus, Buddhists, Jains, and Bon. The favored lake and the mountain-homestead Shiva is a spirit satisfying endeavor, the hardest on earth, exploring through the high statures of Himalayas. Dependably pioneers get a handle on the troublesome Kailash Mansarovar Yatra to look for the gift of Lord Shiva. As demonstrated by tales, circumambulation of Mount Kailash and after that a favored make a plunge the Mansarovar Lake washes away sins of past 100 lives. It is in a like way trusted that taking a plunge on full moon night is undefined to 10 yards. The Kailash Mansarovar Yatra is one of the holiest voyages for the Hindus, Buddhists, Jains, and Bon. The extraordinary lake and the mountain-home Lord Shiva is a soul fulfilling try, the hardest on earth, inquiring about through the high statures of Himalayas. Reliably pioneers understand the troublesome Kailash Yatra to search for the endowment of Lord Shiva. As shown by legends, circumambulation of Mount Kailash and from that point on a favored make a dive the Mansarovar Lake washes away sins of past 100 lives. It is in like way believed that taking a bounce on full moon night is proportionate to 10 yards.onate to 10 yards. In case You are pursuing down Home Shifting Service, indialogisticpackers Packers and Movers in Moradabad is Top Packers and Movers Service in Moradabad, the practiced movers at indialogisticpackers Packers and Movers Moradabad perceive how to get you there. We’re a full-advantage, single-source Packers and Movers Solution Moradabad for all your Household Goods Relocation needs. Along these lines, we give you a choice of many, distinctive Packers and Movers Services in Moradabad, in light of the manner in which that we grasp your necessities are rise. Likewise, we’ll work with you about, totally, to promise you a move that is secured, attainable, sensible … accordingly suitably executed that you’ll have nary a cerebral torment! Recognize we’re tricking? Basically look at what past customers need to state about us! An enormous bit of our customers uncovers to us the whole they respect the cleaned capacity of our staff and get-togethers. Also, they portray that cleaned methodology essentially concerning the thought. Manali is a famous North Indian hill station in Himachal Pradesh known for its incredible natural beauty. With many rivers, mountain peaks, landscape and heritage temples, the place has something for everyone. Every year, Skiing lovers from about the world visit Manali to enjoy high skiing on the slopes of Rohtang Pass and Solang Valley. Himachal Holiday Packages pleasant hill standing offers some of the best skiing slopes across India. Winter season in Manali begins from December and lasts till the end of the February, however, Skiing is subjected to snowfall. Generally, one can enjoy Heli-Skiing in Manali and its adjacent areas. Avail the best goat feed supplement and additives which helps in better health and growth. Avail the best supplement from here. look the celebrities wiki, bio, age and net worth 2019.. Awesome blog. It is really awesome blog. Thanks for writing this blog. Inspiring and very quality writing.